It’s been called Montreal’s Ultimate Outdoor Winter Rave. 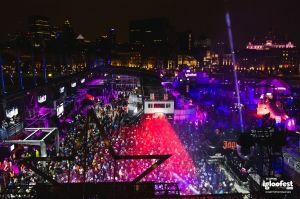 Igloofest recently returned to town for the ninth edition of the popular electronic music festival, a cool way to hear the hottest tracks on four three-day weekends from January 16 to February 8. Clay Paky Sharpy and Sharpy washes and A.leda B-EYE K-20 fixtures helped light up the night for tens of thousands of fans. An aerial view of the Igloofest crowd in Montreal. Montreal-based Karl Gaudreau of 4U2C was the visual/lighting designer for Igloofest 2015 creating the set, video and lighting for the unique music experience. Solotech in Montreal provided the equipment. Gaudreau deployed 60 Sharpys, 16 Sharpy washes and 16 B-EYE K-20. He opted to use 26 Igloo domes from Clay Paky to protect the Sharpys. Clay Paky Igloos are sturdy, injection-molded enclosures for outdoor moving lights. They offer complete protection against the elements – a must for Montreal outdoors in winter. “Everything performed just great despite all the challenges Igloofest presents,” he reports.